If your browser supports the video tag, below you will see a short movie of my first Android animation demo. Otherwise you will just see a boring text message. Let me know if this works for you; it seems an interesting new way of presenting features in my Android applications. I wrote my first animation on Android! 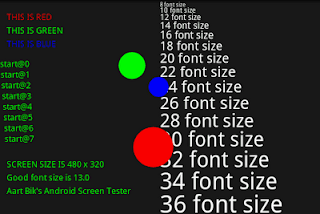 It is actually part of a simple screen tester, where I can inspect the screen size of a device and see different font sizes, colors, and text positions. For fun, I added three moving balls (the circles in the screenshot below), all bouncing between the four screen borders. I received an email from Rein Halbersma who suggested an improvement for Checkers for Android by accepting a move as soon as any ambiguity has been resolved. In many cases this enables single click input. I have implemented this request, together with extending the "move coach" to show all valid moves, as illustrated below. Hopefully this new option is useful for people that are learning checkers. 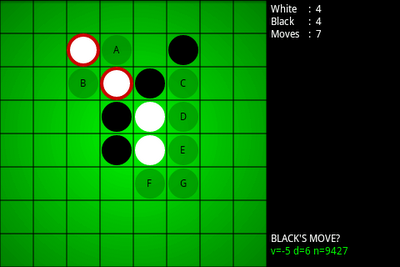 Both improvements are available in v2.3 of Checkers for Android. 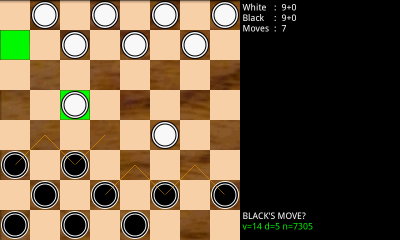 Although I like the wooden board textures that I use for chess and checkers, I was never quite happy with the board texture I used for Reversi for Android (some called it a dirty pool table :-). Therefore, I am trying something new in version 2.3. Instead of using a texture, I use a radial gradient on the board, which gives the impression that the board has been placed under a lamp. This new approach also slightly reduces the size of the binary. Let me know what you think.